We have signed a deal with DHL in May 2012 to offer you the speediest and most affirdable shipping service all around the World. Prices we can offer to you, our customers are mostly as good as shipping with USPS Priority mail but with almost uncomparable level of service. This is your alternative to ship content of your mailbox to your home address. DHL delivers shipments faster than USPS and is able to ship packages exceeding weight and dimensional limitations of USPS. Also customs proceedings are faster and easier than with postal service in many countries. On the positive side we can also add detailed tracking of all shipments with estimated delivery times and very friendly support in case of problems. Standard delivery time to most of the World is 3 days! (and imagine that we are shipping against the time zones, it makes the delivery times even more interesting). Shipments shipped out on Friday are usually delivered following Monday and you can watch real-time tracking. All shipments are being handled by customs office run by DHL and they are delivered right to the destination address (door-to-door). 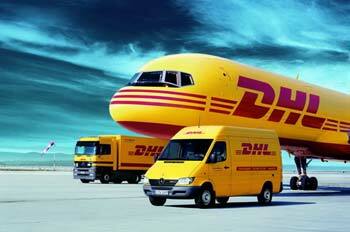 All shipments have state-of-the-art detailed tracking. Dimension of shipments is not strictly regulated (it just has to fit the airplane), also there is no known limit on weight. Large shipments have slower delivery though, about 4-5 days. Price of the shipment is based on volumetric weight, to get the correct volumetric weight use formula length + width + depth (in inches) / 139. If this value is higher than actual weight of the shipment, you will be charged based on volumetric weight. Shipments where on or more sides exceeds 48 inches (122 cm) will be subject of surcharge of 50 USD. If you live far from DHL Depot your place might be considered as remote, DHL applies surcharge of 26 USD for delivery to Remote Service Areas. You can avoid this problem by shipping your stuff to friends or family living closer to the source. When you close your new outbound shipment you will be offered shipping price based on acutal weight of the shipment. If consolidated shipment has higher volumetric weight you will be informed prior to dispatch about the new shipment price and also offered alternatives and prices to ship out your shipment. After you confirm changes your shipment will be dispatched.